– A comprehensive online and in-person evaluation and assessment. – Small group training sessions 3x a week for one month (or online programming if you’re not local). – A fully customized nutrition plan. – This is no joke to me, and you will be treated like a regular paying client. – I understand gaining control of things like your physique, health, and performance takes practice, time, and patience. – However, if at any time I suspect you’re not taking this seriously (show up late, etc.) I’m going to cut the coaching short. 1. Share this on Facebook here. 2. Explain your story and/or why I should pick you. Give as many details as possible and feel free to get creative. 3. You can also “like” my page to show your support, but it’s not necessary. THE WINNER WILL BE PICKED RIGHT BEFORE VALENTINE’S DAY ON FEBRUARY 12TH, 2017. – I’m deciding who is chosen based on the most liked story/post of all participants. – I’m also going to use my own personal judgment if necessary. 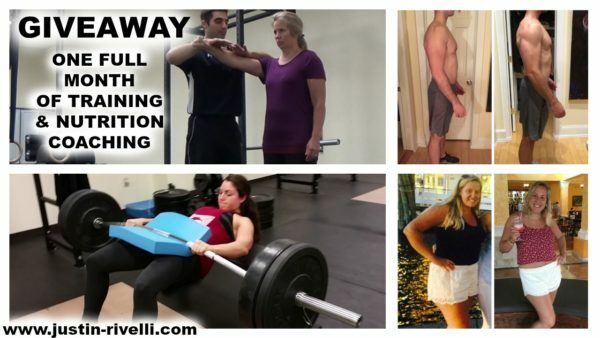 – Any goals (health, body fat reduction, muscle gain, etc.) all qualify. If you have any questions just let me know. I’d be pumped to help. Previous: Cage Movements By Body Part!